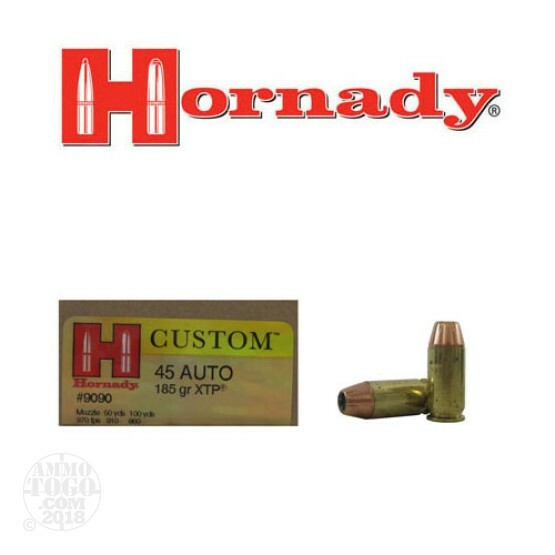 This is 45 ACP Hornady XTP 185gr. HP Ammo. XTP bullets are famous for their ability to expand reliably across a wide range of velocities. The XTP bullet was specially built to withstand incredible velocities, and still deliver controlled expansion and weight retention. Special features in the nose facilitate and control expansion on impact. XTP bullets consistently deliver the deep, terminal penetration needed for one-shot kills. The XTP is one of the most accurate pistol bullets ever made. This ammo is brass cased, boxer primed, non-magnetic, and non-corrosive. It comes packed in 20rd. boxes. Muzzle Velocity: 970 fps.